The Grand Prix of Figure Skating Series 2016/17 continues this week with the NHK Trophy in Sapporo, Japan November 25 to 27. NHK Trophy is the sixth and last event in the series and thus provides the last opportunity for skaters to qualify for the ISU Grand Prix of Figure Skating Final. 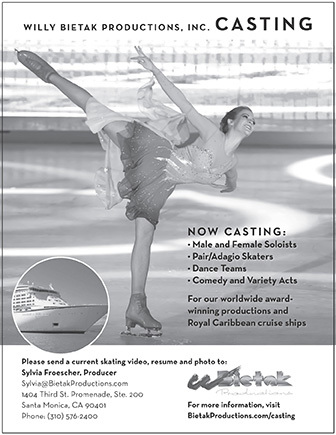 Skaters also compete for a prize money of US $ 180,000 per individual event of the Grand Prix. Reigning Olympic Champion Yuzuru Hanyu (JPN) leads the Men and aims at qualifying for the Final again. The reigning World silver medalist had taken the silver medal at Skate Canada International in October. Several other skaters have set their eyes on the podium as well and have a good chance to make it to the Final: Jason Brown (USA) comes with a silver medal from Progressive Skate America while Alexei Bychenko (ISR) has a bronze from Rostelecom Cup. Nathan Chen (USA) and Mikhail Kolyada (RUS) who placed fourth in their first event want to get onto the podium this time and also still could make it to the Final. In the Ladies event, competition promises to be exciting with 2016 Four Continents Champion Satoko Miyahara (JPN), 2016 World bronze medalist Anna Pogorilaya (RUS), 2016 Four Continents silver medalist Mirai Nagasu (USA) and World Junior medalists Maria Sotskova (RUS) and Wakaba Higuchi (JPN). Miyahara, who claimed bronze at Skate Canada, Rostelecom Cup Champion Pogorilaya, Trophee de France silver medalist Sotskova and bronze medalist Higuchi all have a shot at the Final. Other contenders include Alaine Chartrand (CAN), Elizabet Tursynbaeva (KAZ) and Dabin Choi (KOR). Two-time and reigning World Champions Meagan Duhamel/Eric Radford (CAN) headline the Pairs event and look for a second Grand Prix gold medal this season after winning their home event in Canada. Cheng Peng/Yang Jin (CHN) just took the silver medal at Audi Cup of China last week and have a good chance to qualify for the Final in their first season as a team. Xuehan Wang/Lei Wang (CHN), Mari Vartmann/Ruben Blommaert (GER) and Tarah Kayne/Danny O’Shea (USA) want to challenge for the podium as well. In the Ice Dance event, all eyes will be on the first duel between current World Champions Gabriella Papadakis/Guillaume Cizeron (FRA) and the returning 2010 Olympic Champions and two-time World Champions Tessa Virtue/Scott Moir (CAN). Both couples have won their first Grand Prix event and want go book their spot for Marseille. 2014 World Champions Anna Cappellini/Luca Lanotte (ITA) want to improve on their fourth place finish from Skate Canada. Other contenders include Victoria Sinitsina/Nikita Katsalapov (RUS), Kana Muramoto/Chris Reed (JPN), Natalia Kaliszek/Maksym Spodirev (POL) and Kaitlin Hawayek/Jean-Luc Baker (USA).